File image of students protesting the election of Donald Trump. On the day after Donald Trump is inaugurated as the 45th president of the United States, tens of thousands of women and their allies plan to march in the Bay Area to denounce the divisive and sexist campaign rhetoric that he rode to victory. The Jan. 21 marches mirror those planned across the country, including the Women’s March on Washington, which is expected to draw some 200,000 people. That event is anticipated to be one of the largest demonstrations against the president-elect thus far — and there have been many following his stunning victory. 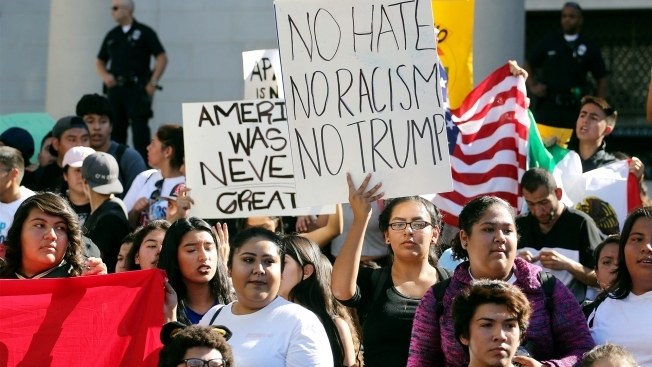 Renee McKenna, an organizer of the San Francisco march, said the aim of the local event isn’t to protest Trump, but rather to celebrate diversity and inclusivity — themes arguably absent from the real estate mogul’s campaign. “The spirit of the Women’s March is to bring people together in community around the things that we believe in and the things that we’re for,” she said. Organizers have also "worked closely" with police to develop safety protocols. A lineup of event speakers will be announced in the coming days, according to organizers. Women’s March San Francisco: 4 p.m. to 9 p.m. on Jan. 21 at the Civic Center. More than 14,000 people have RSVP'd on Facebook, and another 31,000 appear to be interested in attending. Women’s March Oakland: 10 a.m. to 3 p.m on Jan. 21 at 9th and Madison streets. More than 19,000 people have RSVP'd to the Facebook event invite, and more than 40,000 others are interested in attending. Women’s March Contra Costa County: 10:30 a.m. to 1 p.m. on Jan. 21 at Walnut Creek Civic Park. Close to 400 people have RSVP'd via Facebook; more than 700 are interested in attending. Women’s March San Jose: 10 a.m. to 3 p.m. on Jan. 21 at San Jose City Hall. More than 2,500 people have RSVP'd on Facebook, and 6,000-plus more are interested in the event. Women’s March Santa Cruz County: 1:30 p.m. to 6:30 p.m on Jan. 21 at Santa Cruz City Hall. More than 1,000 people have RSVP'd via Facebook, with another 531 interested in attending. Other marches happening in California and across the nation can be found here. Some protests happening on the morning of the inauguration are targeting Trump more specifically, including a second wave of the #NotMyPresident protests that erupted immediately after the election. Those, too, are likely to draw thousands in the Bay Area. Are you planning on attending one of the marches? Are you organizing a rally supporting President-elect Donald Trump? If so, contact Gillian.Edevane@nbcuni.com or 669-263-2895.